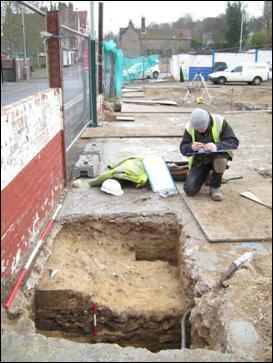 To view some examples of Norvic Archaeology 'Grey Literature' site reports, click here. September 2017 - This section will be updated soon, for latest updates and news please click here. 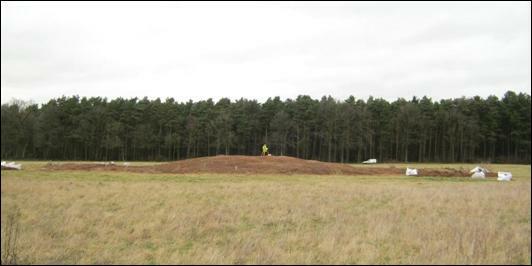 Archaeological Monitoring and Earthwork Survey at Weasenham Great Barrow, Norfolk. Weasenham Great Barrow is a Scheduled Monument and one of a number of barrows that form part of a late Neolithic or Bronze Age barrow cemetery. The Great Barrow is one of the largest and most impressive extant burial mounds in Norfolk. Norvic Archaeology was commissioned to monitor a phase of improvement works at the monument during the removal of bracken litter across the site as part of a Higher Level Stewardship Historic and Archaeological Feature Protection scheme. This was undertaken in accordance with a brief issued by the Norfolk Historic Environment Service on behalf of English Heritage. An assemblage of worked flints was collected from the surface of the monument consistent with a Late Bronze Age period of activity at the Barrow site. Prehistoric pottery collected from the central mound may be from a small Bronze Age to Early Iron Age vessel. The morphology of the central mound and its surrounding banks and ditches became much clearer and well defined following removal of the bracken litter. This allowed an opportunity to conduct an earthwork survey to augment existing records of the monument. 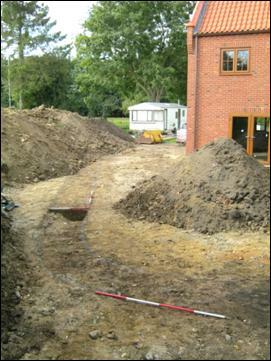 Archaeological Evaluation & Subsequent Excavation at Mill Road, Hengrave, Suffolk. The residential development site is situated in the immediate vicinity of the Fornham Cursus parts of which are a Scheduled Monument. The cursus, formerly ditches and banks that are now visible as cropmarks, stretches for over a mile between Fornham and Hengrave. It would have been a significant Neolithic landscape feature and is interpreted as a processional way dating to 3500 - 3000BC. Following the results of an evaluation by trial trenching in January (which revealed a ditch and posthole and recovered a freshly preserved assemblage of prehistoric flint) the area was subject to further excavation works in April. The preliminary results show a series of field boundary ditches of possible Roman to Saxon date which have disturbed pockets of Late Mesolithic and Neolithic flint working across the site. 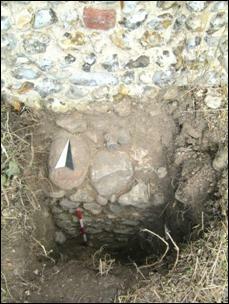 Archaeological Excavation at Mautby Church, Norfolk. Excavations to enable the construction of a kitchen and toilet block extension on the north side of St Peter & Pauls’ Church at Mautby revealed numerous medieval to post-medieval burials. 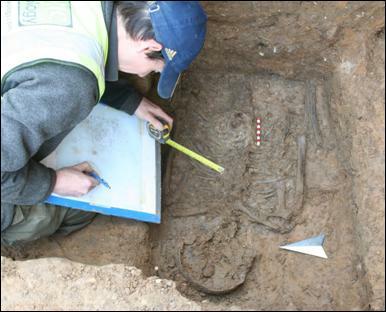 The area appears to be a focus for the burial of mothers and young children along with the remains of a possible medieval priest burial close to the north door. This individual was particularly unusual in that he was buried with a wax object on his chest, in the form of a paten dish. The wax object was in a poor but clearly recognisable state. Although rare, similar wax objects have been recorded from medieval burials in the form of replica chalices. Intriguingly a Victorian coffin burial placed above the same location as this ?medieval priest was buried on a north-south orientation, a highly unusual practice within Christian cemeteries. The coffin was adorned with metal plate decoration and may be an important individual or clergyman associated with the church. Archaeological Monitoring at The Red Lion, Attleborough Road, Caston, Norfolk. The Red Lion Pub is located within the historic core of Caston, close to the Holy Cross Church and the site of a medieval cross. 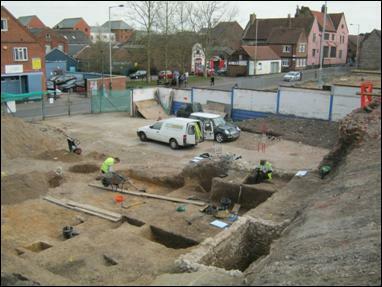 Monitoring of groundworks for a new house & garage on the site of the former beer garden revealed part of a medieval ditch system, either acting as field boundaries or plot boundaries for medieval settlement. Medieval pottery sherds included fragments from storage or cooking vessels of common use in domestic kitchens and households from the 12th to 14th century In addition a single prehistoric flint tool (a modified Early Neolithic end-scraper) was collected from an archaic subsoil. 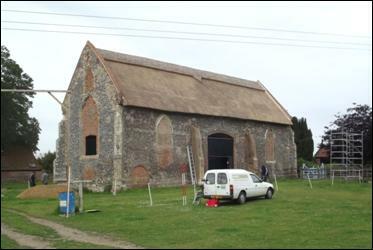 Archaeological Monitoring at St. James’ Hospital Chapel, Horning, Norfolk. 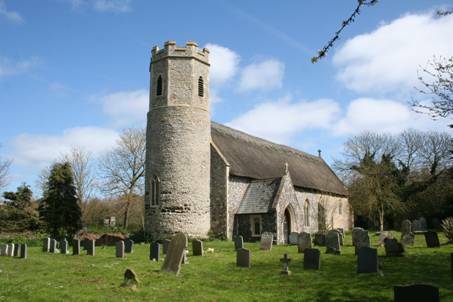 St. James’ Hospital Chapel is a Grade II listed building/Scheduled Monument associated with St. Benet’s Abbey, a pre-conquest Benedictine foundation, the precinct of which lies c.1km to the east. The two sites are linked by a raised causeway across the marshes. The role of the site as a medieval hospital may have served a variety of functions. It would have been a place to offer ‘hospitality’ to travellers and pilgrims, which the monks were obliged to offer in accordance with the rule of St Benedict. It may also have been a place of care for the sick, elderly and poor. 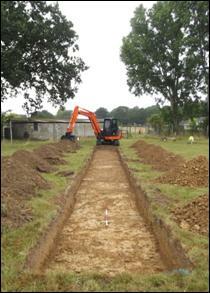 Norvic Archaeology undertook archaeological monitoring during an extensive programme of drainage improvement works funded from grant-aid issued by Norfolk County Council as part of the Norfolk Monuments Management Project, which itself has received funding from English Heritage. This funding was provided to contribute to a programme of repairs and a management programme (initiated in 2012) which will run for a five year period. A large medieval ditch was discovered which runs below the north-west corner of the chapel. This appears to indicate a reorganisation of land use, possibly coinciding with a rebuilding programme at the hospital site following fire damage to an earlier building in the 1340s. Two stone-packed, linear features of medieval date were revealed on the south side of the chapel, these are tentatively interpreted as pads or footings for a structure. Partial exposure of several buttress pads and part of the chapel wall footings allowed for limited examination of the fabric and form of their construction. A small number of prehistoric flints were collected as residual finds which indicate Late Neolithic to Bronze Age activity in the vicinity of the chapel site. Archaeological Monitoring at Hillcrest, Clippings Green, Mattishall, Norfolk. Monitoring of residential development suggests that this area was demarcated as a parcel of land from as early as the 13th century, most likely in association with the medieval moated site at Clippings Green Farm to the north. The site is positioned at a former medieval common-edge location. 23 pits of varying shapes and sizes were recorded that can all be attributed to medieval clay extraction activity of a likely 13th century date. The boundaries of two north to south plots measuring c. 6m in width can be loosely defined from the distribution of the pits. The pottery collected from the site has a relatively high proportion of glazed wares, possibly indicating the presence of a higher status household in the vicinity. The pottery has contributed valuable evidence for medieval rural pottery production, in an area of Norfolk where little evidence has been previously recovered. 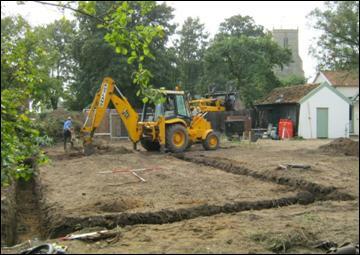 Archaeological Strip, Map & Sample Excavation of land at Swans Nest House, Watton Road, Swaffham, Norfolk. An archaeological geophysical survey carried out on agricultural fields immediately to the south of the site identified a large double-ditched enclosure with the potential to extend into the development area. 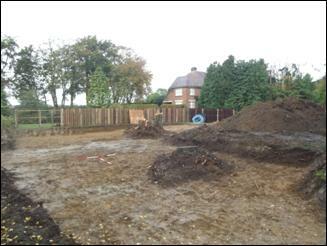 Although currently of unknown date, the enclosure is similar in form to Middle Bronze Age enclosures excavated elsewhere in East Anglia.. Norvic Archaeology was commissioned by Walnut Farm Developments Ltd to undertake a Strip, Map & Sample Excavation ahead of planned residential development. A small assemblage of finds was collected during the work, which include Late Neolithic to Bronze Age flints, a single sherd of abraded Romano-British pottery and a 17th century trading token. Norvic Archaeology was able to demonstrate that the area lay beyond the suspected Middle Bronze Age enclosure and development was allowed to proceed with no further requirement for archaeological works. Archaeological Evaluation through Test-Pitting at the Chapter House of Walsingham Greyfriars, Norfolk. 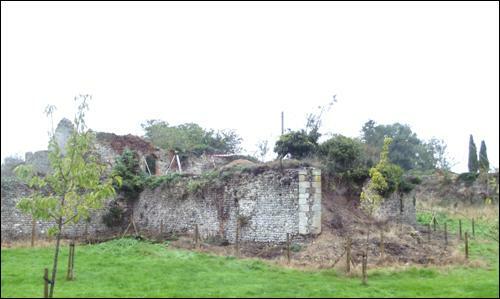 Norvic Archaeology undertook a targeted test-pitting survey of the remains of the Walsingham Greyfriars’ Chapter House (part of an extensive complex of remains of a Franciscan Friary, which was founded in 1347 and dissolved in 1538). English Heritage and the Norfolk Historic Environment Service (NHES) requested the survey be undertaken in order to allow a suitable mitigation strategy to be considered in response to proposals for a programme of repair & consolidation work to the fabric of the Chapter House. This forms part of a greater work programme at the site partly funded by Natural England through Higher Level Stewardship. The excavation of five test-pits has provided information regarding both the character of the Chapter House footings and the infill deposits it retains. In addition, new data on the general method of its construction and information pertaining to the floor level within the Chapter House has been gained. The Chapter House walls appear to have been constructed in a series of lifts, making use of temporary platforms of rammed earth which brought the floor level closer to that of the Great Cloister. A sequence of demolition debris has been dumped within the Chapter House, which includes post-medieval materials relating to later activity at the site. 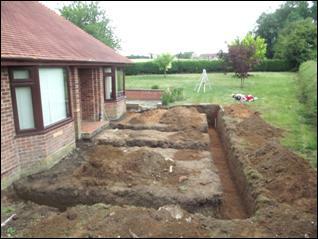 Archaeological Excavation/Monitoring at Rectory Road, Aldeby, Norfolk. 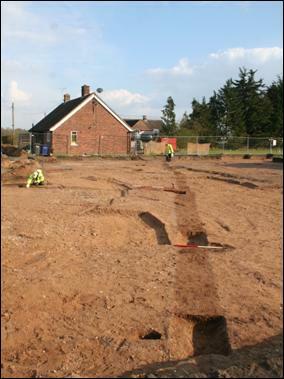 Archaeological excavation & monitoring of groundworks for a home extension revealed a large V-shaped ditch of possible Roman date along with evidence of a timber structure of likely medieval to early post-medieval date. Prehistoric flints and pottery of Late Bronze Age date were also collected. The site is located close to the location of a Romano-British temple and an extensive complex of cropmarks (identified through aerial photography) which indicate prehistoric to Romano-British settlement in the immediate vicinity. Archaeological monitoring of a residential property on a plot located within the precinct of an Augustinian Priory (founded in the 13th Century and dissolved in 1538) discovered evidence relating to the former presence of a timber structure at the street frontage of Burnt Lane, where beamslots and postholes defined the south-west corner of a late medieval building. Notable finds include a sherd of Late Saxon imported ware, fragments of medieval brick, roof tile and wall plaster and a coin pendant or love token made from a 1909 Edwardian farthing. 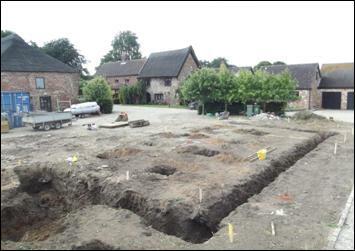 Archaeological Evaluation of land for a Manège at The Stables, Church Road, Bergh Apton. The Manège is located close to an Early Saxon Cemetery, of which sixty-three graves were excavated in advance of gravel working during 1973. The evaluation successfully proved that the extent of this cemetery lay beyond the area of development. Finds collected during the work are consistent with residual evidence for both prehistoric and Romano-British activity in the general area of the site. They include metal working debris, a fragment from a Romano-British fastener or harness fitting, abraded sherds of Romano-British pottery and an assemblage of Late Bronze Age worked flint – which includes an exhausted core and a side-scraper. Giles was part of a team of local freelance archaeologists who were afforded the exciting opportunity to excavate, record and lift the remains of a very rare example of a complete medieval boat uncovered during flood alleviation work at Heckingham. 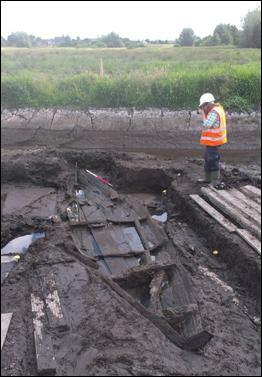 The ‘Heckingham Boat’ is dated from c. 1400-1600 AD and is a clinker built, double ended boat with a sail. The boat is currently undergoing a programme of conservation & preservation at York and will be returned for display in Norfolk. The site lies within the former precinct of St Olaves Augustinian Priory, the ruins of which include elements of the church, cloister and refectory. During the work a medieval ditch was discovered, which corresponded with cropmarks visible in the field to the north. Similar cropmarks have been recorded previously which relate to fishponds, trackways and field boundaries associated with the Priory. A small number of artefacts were collected as residual finds, which included medieval pottery, a medieval glazed floor tile and possible fragment of ?Roman pilae tile. Selective Archaeological Building Recording at the Little Cloister of Walsingham Greyfriars, Norfolk. Norvic Archaeology was commissioned to undertake selective archaeological building recording to the satisfaction of English Heritage during consolidation & repair work of the southern range of the Little Cloister of Walsingham Greyfriars, Norfolk. The Little Cloister ruins are part of an extensive complex of remains of a Franciscan Friary, which was founded in 1347 and dissolved in 1538. The character of the window arches has been recorded and demonstrates a fairly ad-hoc approach to the use of medieval brick, whilst the various sockets and scars are the only surviving evidence for the nature of former timber work set above the southern walk. Many of these sockets can be interpreted as having once supported joists to support a ceiling or floor, perhaps for a lost first storey along the southern range. 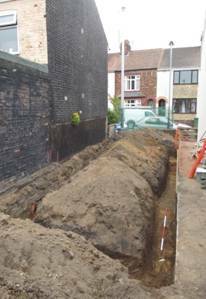 Norvic Archaeology carried out an extensive programme of mitigation work on King Street ahead of development of a former garage site opposite Dragon Hall. The work took several weeks with hand excavation of all pile pits and an open area excavation in the central area of the site. A complex history of the site was uncovered and recorded which included minor prehistoric activity, early medieval and post-medieval quarry pits, medieval to post-medieval buildings and numerous wells and floor surfaces. - The substantial stone footings of a medieval building were found just below the modern street frontage which are part of a high status house gifted to the Friars of St Mary of ‘De Domina’ in c. 1290, their house passing to private hands following the Black Death of 1349. - Of over 100 small finds, artefacts of note include medieval coins, painted window glass, decorative strap ends, a lead stylus and a finger ring. The building sits adjacent to the Town Wall and Scheduled Monument consent was granted with conditions from English Heritage in advance of the works. The defensive walls date from the 13th century with alterations made to accommodate cannons during the first half of the 16th century. Work undertaken during the conversion of the commercial unit to residential flats uncovered the top of the Town Wall along the full length of the building. 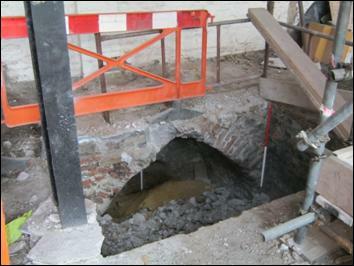 Below a concrete slab the surprise discovery of a Victorian storage cellar was made which utilised an arch vaulted niche in the town wall. The embrasure for the former arrowloop had been blocked with late post-medieval brick. 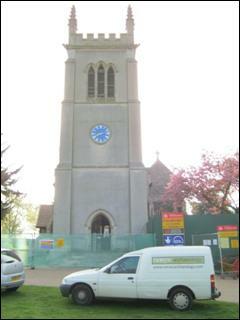 Norvic Archaeology was commissioned by Freeland Rees Roberts Architects on behalf of Ickworth Church Conservation Trust, to undertake archaeological monitoring of access improvements at St Marys Church in Ickworth Park. 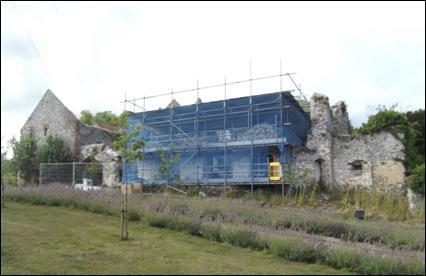 The Trustees have raised funds in partnership with English Heritage and the Heritage Lottery Fund to undertake a wider programme of intensive restoration: including repairing the roof, conserving the stained glass and medieval wall paintings and conserving the internal furnishings. The church is the oldest surviving building in the Ickworth Estate and a former parish churh for a lost medieval village. From the 15th century until the middle of the 20th century, the landowners were primarily the Hervey family who later became known as the Earls and Marquises of Bristol. The church has served primarily as a Chapel of ease for the Hervey family from the 1700s. Finds collected during the work include musketballs, medieval pottery and a Mesolithic flint scraper. In February Giles was a guest speaker for the Eastern Electricity Retired Employees Association and gave an afternoon talk at Chantry House. The talk focused on recent archaeological projects around Norwich and included a presentation on the results of evaluation work at the site of the former Electricity Offices off Duke Street, where many of the members once worked. The club kindly made a donation to ‘Little Hearts Matter’ charity on his behalf. For the archive of past projects please click here.